In August 2006, the Cambodian Government granted economic concessions in Koh Kong Province to two Cambodian sugar companies (Koh Kong Plantation and Koh Kong Sugar Industry), both jointly owned by the Thai company KhonKaen Sugar Industry, Taiwanese VeWong Corporation and Cambodian Senator Ly Yong Phat. About 4000 Koh Kong villagers claim that they were violently evicted from their lands and relocated involuntarily to make room for a sugar plantation run by the Koh Kong companies. The Koh Kong companies entered into a five-year contract with the UK-headquartered company Tate & Lyle for sale of sugar from these plantations in 2009. Distance is an especially daunting obstacle for handicapped or disabled children. One 17-year-old boy from Pis had an accident a few years ago and cannot walk. There are no services in the resettlement village to help a disabled person. With reduced household income and food security, parents are forced to reduce or eliminate school attendance. Many households reported greater difficulties paying for education-related expenses such as materials, informal teacher fees and uniforms. Child labor on the sugar plantations was widely reported in all areas. Children as young as 8 years old in Koh Kong regularly work alongside family members or alone cutting, tying and carrying cane bundles or in second planter/picker, sprayer and grass cutter positions. 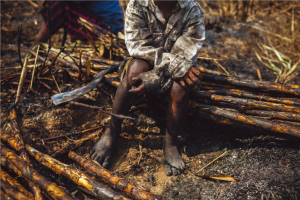 From the assessment report, 85 children under the age of 16 working on the Koh Kong sugar plantation. The vast majority of these are under age 15, and 13 of the child laborers are only 11 years old or younger. These children come primarily from villages, where their families lost their land and livelihoods to the sugar concessions. The village of Klity, 68 miles west of Bangkok, is a Karen indigenous community which has long suffered from poisoning related to lead sediments and contamination in the creek near the village. A lead mine operates and discharges waste directly into this creek, from which the villagers collect their drinking water. Each of the village’s 221 inhabitants suffers from lead poisoning (Black Smith Institute,2004). Klity Creek is Known to be one of the worst sites of industrial pollution in Thailand. It is threatening families in the village with serious and irreversible health problems, including development problem, mental disability and even blindness in some cases, as they are exposed to lead through water, soil, fish, and vegetables. “Almost people including children have been contained lead toxic in their blood and bodies (dangerous levels) which affected to their health, and mental and physical abilities. Specifically for children, the impacts to their learning, brain and some new–borns were taken birth and died suddenly. Normal children should go to school, but some of them lost the chance to attend school because their incomplete body abilities. 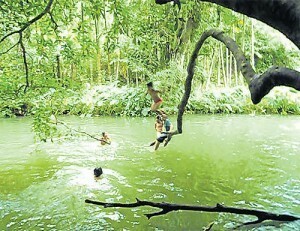 The children in Lower Klity Creek village love river and swimming, but because of the river is polluted heavily by lead contamination, so they cannot swim enjoyably.”– Mick, youth from Klity Creek village. Children and pregnant women are particularly susceptible, and high levels of lead exposure can cause permanent intellectual and developmental disabilities, including reading and learning disabilities, behavioral problems, attention problems, as well as hearing loss and disruption in the development of visual and motor functioning. Children who had elevated lead levels did not receive follow-up medical care. The most sensitive targets for lead toxicity are children’s developing nervous systems, the hematological and cardiovascular systems, and the kidneys. . Pregnant women and children are particularly vulnerable to lead poisoning. In pregnant women, it can cause premature birth, low birth weight, or damage the foetus’ developing brain. Experts recommended chelation therapy when a child is found with a test result of greater than or equal to 45 micrograms per deciliter of lead in blood, but nor now lower because at lower levels chelation is ineffective. The Lower Sesan2 Dam is currently under construction at the 1.5 km far from the confluence between the Srepok and Sesan rivers in Stung Treng province, northeastern Cambodia. The Sesan river is a major Cambodia tributary of the Mekong, the two rivers joining in Stung Treng province where the provincial capital of the same name is located. 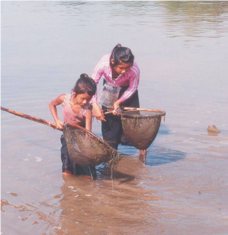 At least 38,675 people, including a large number of indigenous peoples, included in at least 86 villages located along the Sesan and Srepok Rivers and in the reservoir area would lose access to the vast majority of their fisheries resources due to the dam blocking fish migrations from the Mekong and Sekong Rivers up the Sesan and Srepok Rivers. In addition, at least 87 villages in Cambodia located along tributaries of these two rivers would also lose access to migratory fish. In total, at least 78,000 people living above the Sesan 2 dam site are expected to lose access to migratory fish. Villagers said that the project will affect to their culture and customs, disturb the ancestors’ graves, and destroy the river and forests they rely on daily for their livelihoods. As many cases, the children is the most vulnerable group that will be affected by the Lower Sesan2 project Due to thousands have been displaced, it could not deny that a lot of children also force to resettle together with their families. The dam could also put in risk the food security of millions people along river and children are potential of this impact. For example, in Stung Treng province, an area of Cambodia where Don Sahong Dam will have a severe impact, 45% of children are already malnourished. A native from Ratanakiri Province passionately told stories about his childhood when he enjoyed spending much of his holiday on Sesan River’s bank fishing and throwing rock into the river. But, it will change if the dam completes. The problem is particularly difficult considering recent reports that the percentage of children classified as acutely malnourished in Cambodia—the number of which had fallen by half between 2000 and 2005—increased from 8.4% in 2005 to 8.9% in 2008, representing a considerable setback (Corey-Boulet 2008). Certainly, if the Sesan2 dam is built, it can be expected that nutritional statistics in northeastern Cambodia would decline even more, thus making it difficult for the Cambodian government to achieve poverty alleviation targets. A Human Rights Impact Assessment of the European Union’s Everything But Arms Initiative in Cambodia”, 2013, Equitable Cambodia and Inclusive Development International. Li Miao Miao “Gaps in the Environmental regulation of Transnational Corporations: a case Study of Cambodia’s Lower Sesan2 Dam, Land and river grabbing, 2015.